There are so many finches in the United States that no backyard should be without them. The males are brightly adorned but the females are drab. The large number of these birds may add color to the backyard until a feeding pattern is established that will draw other colorful birds to the yard. Finches belong to the largest family of North American birds. Technically they include birds called grosbeaks, finches, sparrows and buntings--all notable for their short, stubby, conical beaks. This trait marks them as seedeaters, their beaks being perfectly adapted to cracking open a wide variety of large and small seeds. Typically, among finches of all kinds males are much brighter colored than the females and their young, at least during the courting and breeding sea-sons. Finches of one sort or another occupy just about every type of land habitat in the US. Some like evergreens, others deciduous trees. Some scratch on the ground among fallen leaves and debris for seeds, others perch on wires and branches. Many have a distinctive undulating flight pattern, flapping their wings briskly, then dipping and coasting momentarily before resum-ing flapping. Sometimes they call out as they make their jerky progress to their intended destina-tion. Finches tend to flock in winter and for migrations, northern species being especially migra-tory and restless. Finches will live from 5 to 10 years. American goldfinches, sometimes called “wild canaries”, are small at only 5 inches long, but they are very pretty. Males have summer suits of bright yellow contrasting with black wings, tail and forehead cap. They have orange bills. Females are a dull olive color, darker above and yellower below. Their black wings have white bars across them, as do the males’. Goldfinches fly in a deeply undulating pattern often singing as they fly. They usually travel in small flocks except during the breeding season. These colorful birds range over most of the US, from the east to northern Baja California. In the wild they are commonly found in patches of thistles and weeds, on lawns, along roadsides, open woods and edges. Listen for their high pitched su--wee call. 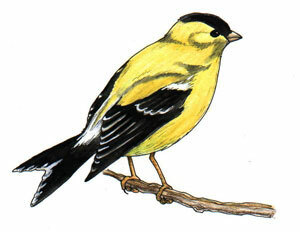 Goldfinches do not migrate, but many people think they do. Males molt in the winter, losing their black cap and trademark yellow feathers and acquiring a drab color which resembles females’ coats and they are thus less visible. The goldfinch is the state bird of New Jersey, Iowa and Washington. House finches are often confused with their western cousins, purple finches, because there are some superficial similarities. However, house finches are smaller-- about five to five and one half inches long. Males are bright reddish, sometimes more orange, with dark stripes on their brownish sides and wings. Females resemble sparrows, brown striped with brownish, finely streaked heads. They lay and incubate four or five eggs, pale bluish-green spotted with black, which hatch after 14 days. They usually have two broods per year. Originally their range was strictly over the western US until some house finches were released in New York City in 1940. Now they are at home all over the Northeast and Midwest around farms, grasslands and suburban landscapes. Extremely domesticated, house finches seem to enjoy being around humans and of-ten establish their permanent homes in urban and suburban neighborhoods. Because they do not migrate, they are regular visitors at backyard feeders year round. At six inches long, purple finches are a bit larger than house finches. Males have such en-tirely red (not really purple at all) faces and heads that they look constantly embarrassed. They also have a hint of a crest, a broad, dark jaw stripe, a dark eye patch and a broad light stripe be-hind the eye. Females are an undistinguished striped brown, with a dark brown patch between their eyes over their crowns set off by white lines over their eyes and on their lower cheeks. They build well-concealed nests in which they lay a clutch of four or five eggs which are greenish-blue spotted with dark brown. The eggs hatch in 14 days. Purple finches range over southern Canada, and in the Pacific states and the Northeast. These finches sometimes winter over where they live, but some head to the southern US if it becomes extremely cold or if they have exhausted the food supply in their summer habitat. When the birds move south, they do so in flocks.